An estimate of the running costs. Significantly greater economy, with reduced energy use and less waste. Reduced emissions of odours and waste fluids owing to closed operation. The possibility of transforming former wastes into products. Reduced labour owing to fully automated and instrumented continuous flow design. SN2 combines extensive experience in pure research, design and construction of chemical plant to give a unique approach to process design. Our wide interests in chemical engineering science and practical chemical processing allow us to synthesise useful new processes by assembling, where appropriate, ideas from disparate processing disciplines. We are continually evaluating new technologies to expand our ideas base. We seek the most appropriate equipment available and the most energy-efficient processes in order to achieve a project's economic optimum. Our experience in feasibility studies and costing the commercial implications of promising new research allows us to make decisions at the design stage on whether a process is worthy of development. Early analysis creates overall cost effectiveness and the best return on investment in the long run. We understand the chemical process from the basic chemistry, to conceptual design, to pilot-plant design, through to such issues as control, safety and regulations that affect the full-scale project. We also understand the iterative nature of design, with the need to revisit earlier premises and to question fundamental assumptions. Eschewing a strictly linear, progressive model of design we can avoid the "losses in translation" that typically occur when bench-scale research is passed from scientist to engineer to accountant. Through experiences of our own and of our clients, we recognise the importance of formal design. Such tasks as: feasibility studies, costing, feed and product specification, scale-up issues, hazards, safety, operability, environment, robust control and efficient commissioning have a big impact on the overall success of a project. As expert witnesses in litigation, many involving plant failure, we have seen projects fail or go severely over budget through lack of adherence to detail and correct procedure. We don't believe in solving engineering issues in court. Our experience in troubleshooting has taught us much about pitfalls and virtues. On one point in particular, we believe the inclusion of a pilot plant in staged development is important if not vital in any innovative project. A pilot plant will discover the inevitable "unknowns" at small scale where problems are solved cheaply. A pilot plant minimises commissioning costs at full scale. Our guiding philosophy is to engineer a successful outcome leaving as little as possible to chance. 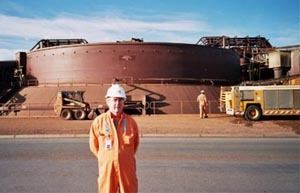 Visit to Western Mining's operations at Olympic Dam to scope WAD's role in supervising a student research project on optimisation of flotation.